When a psychologically disturbed senior samurai shows up who masters the art of fighting with two katanas , you know you're in Shogun territory. It's worth taking a slow ride. Matsuoka can pass an important plot point or beautiful vignette by you in the flash of a geisha's eye.The perceptive & receptive prince Genji is borderline implausible, but any story set in pre-Restauration Japan needs a foreigner-friendly perspective to sell. It remains the ideal period setting to reflect upon the strengths, flaws and compatibilities between two cultures. The reader always shares in the Bildung process. Genji's subtle attentions towards the well-being of the people around him show life between the lines of history. An immature, heavily indepted bodyguard and a spinster handmaiden are steered towards the happy stability of married life. A teenage farmer's daughter who wouldn't mind a one night stand with an entitled but handsome nobleman remains untouched, her father handsomely rewarded for his hospitality instead. Don't ask how a Wild West gunslinger wins a bamboo swordfighting contest on a few hours of training against warriors who could sever before they were toilet-trained. Just don't. The book rushes into its ending with the greatest implausibility of all: a traumatised Anna Leonowens migrating to Japan in the 1860s is one thing, the reverse quite another. It's a lousy set-up for sequels. We knew that Genji's vision of the firstDietmust either return by epilogue or sequel unless the pace quickens from Shouru's horse to his visions of Tokyo commuters. But at this point, we have been dipped again and again in the dark past of these two strangers in a strange land. We want to see them overcome their demons. We also want to see the schism among Japanese nobility play out: those too entrenched in the outer aspects of tradition to accept the dawn of the new age, and those that want to "enrich the land en strengthen the army" so that their values can survive behind the protection of Western knowledge and technology. A streamlined version of Shogun, sacrificing some of the depth of characterization and subtlety of political power games in favor of extra servings of ninja duels, geisha seductions and personal vendettas. The conflict between the Eastern and Western cultures is moved from 1600 to 1861, and the strongarming of the Tokugawa Shogunate by American and European warships into opening the country for trade (or legalized robbery as it turned out). Japan is on the brink of major shift in policy, not yet strong enough to respond to the foreigners provocations and held back by a medieval social system that has remained unchanged since the Battle of Sekigawara - often mentioned in the text as the previous major turning point in the history of the nation.The main Japanese players are a progresive daimyo (Genji), his household retainers, his mentally deranged uncle, the most famous geisha in Edo , the chief of the Shogun's secret police and a ninja in his service. The american actors are a fiery pastor trying to establish a Christian mission and convert the "heathens" with the help of his fiance and a new recruit that hides a past career as fast gun and bank robber in Texas.The first half of the novel, setting up the plot and giving the background stories of the main cast is very well done, fast paced, complex and competently written. I was personally less impressed in the final chapters, where I felt the build up was a bit wasted in a rush to cram as many physical conflicts as possible and the plot twists proved to be less surprising than promised. The prose is very good for a debut novel, and if it didn't capture the lyrical nature of the Japanese cultural identity as convincing as I would have liked, it made up for it in historical context and ordinary life details from the period.My major issue with the story comes from the use of prophecy and the gift of foresight - a major component of the plot that has its place in a fantasy setting, but was anachronistic and fake in a historical novel. Matsuoka tries to temper the supernatural by implying this ability to see the future is a device used by the daimyo to control his vassals and adversaries, but he gives too many hints about 20 Century events for the argument to gain traction.The dialogue and the characters have a Hollywood flavor that is a bit shallow and theatrical, but I believe the story would translate well on the big screen. In fact, The Last Samurai has many similarities with Cloud of Sparrows. It was not may favorite movie, but it was entetaining. And so is the book. Che SPETTACOLO!Trovato in una libreria dell’usato, pagato una sciocchezza, aspettavo di leggere questo libro da anni. Oggi è praticamente introvabile, sono stata fortunata!Ambientato nel Giappone dell’800, con una possibile invasione straniera alle porte, il giovane Genji, capo del clan Okumichi dovrà affrontare un possibile tradimento.Scritto in maniera corposa ed impeccabile, questo libro fa emergere le divergenze di due opposte civiltà che però sono in egual misura dilaniate da violenza, sospetto, tradimento. Un viaggio straordinario che permetterà di compiere il destino di un capoclan e un dono particolare che darà a Genij la possibilità di conoscere il futuro. Il futuro potrà essere cambiato? Solo il tempo darà la risposta al giovane nobile che dovrà imparare a convivere con i due missionari sbarcati dalle grandi navi. Perfetto, il metodo narrativo rievoca un Paese lontano e tradizioni millenarie, che si scontrano con la necessità e la curiosità di un popolo di assaporare la modernità. Personaggi perfetti. Ognuno con una storia molto particolare da raccontare, anche i secondari, è stato bellissimo pagina dopo pagina, vedere il loro modo di approcciarsi alla vita, alla morte, a tanti aspetti dell’esistenza in maniera differente ma sotto molti aspetti molto simile. Consigliato! This was such a good book, but maybe not for the reasons most people will talk about. Yes, it is similar to Shogun and The Last Samurai in scope, detail, and entertainment. And the writing is so evocative; so many details about Japanese culture during the pre-Meiji era that I get off on. For me though this wasn’t just a drama of that time period in Japan; it was more than that. I felt in some ways this was a very spiritual story. Author Takashi Matsuoka incorporates a lot of Zen Buddhist philosophy that the samurai way of life embodied. I enjoyed this the most. Genji is a daimyo of a small clan. He comes from a direct line of daimyo that have the ability of pre-cognition. It’s well known amongst the clans that this is the case. I found it interesting how the author used this in conjunction with Zen Buddhism to show how Genji is able to lead and what drives him. Genji feeling that he has pre-cognition, does have visions as he was told he would. He’s told that a foreigner would save him from death so he keeps the missionaries he agrees to host close to him, to the distain of his people and the Shogun’s allies. His uncle Shigeru, who was the leader of the clan in the past, has literally gone mad from his visions of the future and is feared as a master samurai as well as someone who has lost it. Genji on the other hand, trusts implicitly his gut feelings and existence. He’s always calm even in the midst of his enemies. He defies his guard’s recommendations on his safety and I felt this kind of interesting. The concept of what will be will be and that it is karma was a theme throughout the story. And he manages in this mindset. One of the other things I enjoyed about this book was how the author shows how much ambiguity plays a role in the constant power plays and shifting alliances and in how Japanese get on with each other. This is definitely a hard concept for the western mind to relate to, but this is where I love to read Japanese historicals and even any Japanese fiction that is written by a Japanese author. So much of the unsayable of Japanese culture comes through. In this type of sweeping Japanese historical drama, I felt this book definitely went more into the Japanese traditional POV than many others, even though several of the main characters are western missionaries who are there to set up Christian missions to spread Christianity. This book was more about the internal struggles of Japan as a country within that context. I enjoyed the constant strategizing thought processes of those in power on how to beat their enemy clans. Also interesting and I liked this, is that the author didn’t put any judgments on either religious or philosophical viewpoint. Meaning, it didn’t present Christian ideology that the missionaries are bringing as better or worse than Zen Buddhism. They are each a belief system that exists. I definitely recommend this if you have any love of Japanese culture. Αν θέλετε να ταξιδέψετε στην Ιαπωνία του 1861, αν θέλετε να πολεμήσετε μαζί με σαμουράι και νίντζα, αν θέλετε να γνωρίσετε τα ήθη και τις παραδόσεις της χώρας, αν θέλετε να συναναστραφείτε με άρχοντες, με σογκούν, με γκέισες, τότε διαβάστε αυτό το βιβλίο. Είναι υπέροχο. Προδοσίες, πάθη, έρωτες, προφητείες περιγράφονται εξαιρετικά από τον συγγραφέα και δημιουργεί μια ιστορία μαγική, σχεδόν παραμυθένια, φέρνοντας κοντά την Ανατολή με τη Δύση. Η πλοκή της ιστορίας γρήγορη και με απίστευτες ανατροπές. Δεν έχω κάτι άλλο να πω. Απλά διαβάστε το. Beautiful story about two Americans and an amazing cast of Japanese warriors whose lives are intertwined in 19th century Japan. Lots of political intrigue, cultural references, gorgeous settings and descriptions. And Lord Genji is on my list of favorite heroes ever. A truly amazing book. Samurai! Ninjas! Geisha! Zen Buddhist monks! Western gunslingers! Christian missionaries! I knew I would like this book - and I was right. Siamo nell'anno 1861, quando Genji Okumichi, daimyo di Akaoka, riceve nel suo territorio lo sbarco di alcuni missionari cristiani, tra cui si trova Emily, che gli appare immediatamente brutta: i suoi colori sono sbagliati, le sue forme sono sbagliate, le sue vesti sono sbagliate. In poche parole, è una bianca occidentale. Nulla a che vedere con le raffinate dame di compagnia di cui Genji si circonda, prima tra tutte la bellissima Heiko, che in realtà non è solo una cortigiana, ma un'abile assassina.Tra giochi di potere, combattimenti a fil di spada, attentati esplosivi, viaggi, incontro-scontro con la tecnologia, religione cristiana e misticismo zen a confronto, la vita dell'affascinante Genji e quella della pudica Emily finiranno per intrecciarsi in modo indissolubile, adempiendo ad una profezia che egli, dotato del dono, ha avuto in passato. Una profezia che lo avvisava anche delle modalità della sua morte.E alla fine la diversità del corpo di Emily diventerà la più bella delle scoperte, e l'estetica di Genji evolverà così come la fede troppo casta di Emily, permettendo loro di avvicinarsi e di avvicinare due mondi apparentemente così lontani.Perciò sarà proprio Emily a tradurre in inglese la storia della vita di Genji, ovvero 'Genji monogatari', un romanzo storico giapponese dell'XI secolo che costituisce una delle pietre fondanti della letteratura di quel paese d'Oriente; così, la letteratura racconta se stessa, mentre pone a confronto due mondi tanto estranei e ci mostra come vincerne le distanze: col potere delle parole. "Ogni vera comunicazione, anche fra due persone che parlano la stessa lingua, richiede una traduzione. Alla fine, il nostro cuore deve udire ciò che non si può esprimere a parole. "Il tutto è raccontato con una bellezza quasi indescrivibile, con metafore poetiche e descrizioni minuziose, ma senza mai scadere nella pedanteria. I personaggi sono tutti approfonditi, dal primo all'ultimo, e mostrano caratteri complessi, tutti animati da almeno doppie intenzioni, non sempre positive, ma non sempre negative; ci troviamo l'amore disinteressato, la pazzia gelosa, il calcolo meschino e la fedeltà sino alla morte; e in mezzo ci troviamo talmente tante sfumature che potremmo riconoscere ogni personaggio solo da come muove la mano o usa la spada o si inchina a Genji.Per questo, non possiamo che inchinarci anche noi. Още в началото съм изненадана от критичния тон на автора по отношение на порядките и традициите в Япония през 19-ти век. Очаквах възхвала на самураите и техния кодекс, може би повлияна от други книги („Шогун” на първо място, „Кодексът на самурая Будо Шошиншу” – Дайдоджи Юдзан) и филми („Последният самурай”), както и общото мнение за японската култура. Не че съм познавач, дори напротив, но явно съм попила някакво общо настроение по темата. А Такаши Мацуока директно обвинява японците в закостенялост, неефективност, в спазването на почти смехотворни традиции. Не е описан сериозен конфликт между старото и новото, няма дилеми на героите кое да приемат – да спазват заветите на дедите си или да се модернизират. В „Облак врабчета” „добрите” са отворени за „прогрогреса”, а „лошите” държат на статуквото – просто и ясно, сигурно за да се покаже неизбежността на идващите промени. Няма описание на японската култура, на ценностите й – а сигурна съм, че има такива. Например религията, относителната свобода да избереш в какво точно да вярваш. Противопоставена на християнството, би могла да спечели няколко точки за японците. Също и култът на чужденците към щастието – критикуван, но без да му се противопоставят сериозни аргументи. Романът не е философски трактат, но малко повече дълбочина нямаше да навреди. Може би както „Шогун” е написан от британец, впечатлен от Япония, така и „Облак врабчета” е написан от гледната точка на японец (или американски японец…), впечатлен от западната култура. Въпреки това книгата ми хареса – има интрига, любовни истории (макар и леко невероятни - любовта побеждава расовите, физическите и културни различия, но не и силата на японската традиция....), сблъсък на култури, неизменните недоразумения в такива случаи. Действието върви бързо, героите са симпатични, макар и лековати – особено Генджи. Колкото и да е хитър, прозорлив, умен, напредничав – идва ми малко лековат. Но симпатичен. Обичам книги, които ме водят в древна Япония. Действително книгата ме върна във времето, когато в ръцете ми попадна "Шогун" на любимия ми Клавел. Тази книга е написана от японец, но пак е заложен конфликтът при сблъсъка на два свята. Толкова са ми интересни японците като мислене, като светоусещане, като психика, отношението им към смъртта, йерархията, строгите правила в нея, невъзможността да сложиш знак на равенство между "проститутка" и "гейша" /ние нямаме подходящата дума за това/. В тези страници се сблъсках с много кръв, но и много романтика, много смърт, но и много мъдрост, много лудост, но и много вярност и самоотверженост. Трудноразбираемо е как умират с усмивка пред смъртта и не трепват изобщо. Имам чувството, че са от друга планета, а не са. Просто мислят различно, възприемат различно, действат различно. In spite of the bloody, brutal and gory scenes, I found myself liking this book. It wasn't just about fighting and getting revenge by clans of samurais, but also about how Edo responded and reacted to the forced opening of the country to the world. It was interesting to read the clash of cultures between Japan and the rest of the world, such as how one would perceive beauty and express its appreciation. At the same time, this difference is also balanced by how compromises can be reached, even though it can get bloody. To make the story more gripping, Matsuoka inserted an element of the supernatural in the story and this adds suspense to the narrative. I'm now eager to read more of the characters and started reading the sequel, Autumn Brdige. "Pengetahuan bisa menghambat. Ketidaktahuan justru membebaskan. Tahu kapan untuk tahu dan kapan untuk tak tahu, sama pentingnya dengan pedang yang tajam." Книга за феодална Япония и началото на контактите и с Европа и Америка, но написана от японец с перфектен стил и познание на епохата. Увлекателното действие е по-добро от много класически романи. Тънка психология и неочаквани откровения допълват мащабната картина на цяла Япония.Романтиката започва още с името на книгата - "Облак врабчета" е името на замък на крайбрежието, ставащ сцена на сблъсъка на два свята.Такаши Мацуока има безспорен талант. 3.5 puntosLo positivo: Historia que viaja entre visiones del futuro y el "presente", el Japón feudal en medio de una guerra civil y la presencia amenazante de los extranjeros. Personajes inolvidables y el contraste entre oriente y occidente; batallas de samurais; un pistolero en busca de venganza; conspiración, complot y cierto toque de romance. El personaje de Emily me pareció adorable dentro de sus temores. Lo negativo: Me hubiese gustado entender un poco más el contexto histórico de ese Japón, su estructura social, ¿Qué es un shogún? por ejemplo. Debido a este desconocimiento, una acción en concreto del protagonista me pareció totalmente sin sentido. Me costó comprender las relaciones y el significado de los cargos de cada personaje, no me resultó tan claro. "Воробьиная Туча", изданная у нас как "Стрелы на Ветру", формально считается первой книгой дилогии, и повествует об истории Гэндзи Окумити - последнего князя клана, его ближайших родственников, вассалов, а также нескольких американцев, чьи судьбы окажутся неразрывно переплетены с судьбой всего клана. После скачущего по эпохам "Осеннего Моста" практически линейное за некоторыми исключениями повествование "Воробьиной Тучи" кажется читерством :) Гэндзи Окумити, бывший одним из многих главных героев "Осеннего Моста" тут фактически становится самым главным. Будучи наслышанным о пророческом даре своих предков, он тем не менее, не особо в него верит, хотя его дед, князь Киёри, предсказал, что у Гэндзи на протяжении всего его жизни ему будет всего три пророческих видения.Став князем в очень молодом возрасте, Гэндзи вынужден бороться с интригами могущественного князя Каваками, начальника тайной полиции сёгуната, желающего окончательно уничтожить клан Окумити и поставить жирную историческую точку в битве при Сэкигахара. Япония того периода подвергается мощнейшему международному давлению, когда США, Франция, Великобритания и Россия совместно давят на сёгунат с требованием открыть страну для торговли и христианских миссионеров. Князь Окумити, подчиняясь увиденному в пророчествах, соглашается на постройку христианской миссии на территории княжества, что в свою очередь, приводит к двум последствиям - совершив столь опасный с политической точки зрения шаг, Гэндзи развязывает руки его противнику Каваками, который использует это как повод посеять разногласия среди военачальников Гэндзи. Кроме того, следствием данного князем разрешения является прибытие американки Эмилии Гибсон, с которой у князя вопреки всем культурным и политическим обстоятельствам возникает роман. "Воробьиную Тучу" можно считать и историей любви Гэндзи к двум женщинам: американке Эмилии Гибсон и Хэйко - самой блистательной гейше Эдо, историю примечательной тем, что даже князю не суждено в полной мере быть свободным в своих отношениях, поскольку на протяжении всей жизни он может считаться жертвой историко-политических обстоятельств и пророческого дара, которое одновременно является и проклятием.Очень крутая книга, полная исторических интриг, экшена (причем внезапно с элементами вестерна) и драмы. Как "Осенний Мост" всячески рекомендую к прочтению. Cloud of Sparrows reads like a cross between an action film, a western, and a cheesy melodrama. That may sound bad, but this pretty much describes most good samurai stories. The senseless violence and insufferable arrogance of the samurai is often juxtaposed with his intense passion, loyalty, depth of feeling, and often ridiculous sentimentality. Set at end of the Edo period, the last years of the samurai, the book opens 6 years after Japan opened its borders to foreigners for the first time in 200 years and 8 years after Commodore Perry threatened to bombard Edo if the shogunate refused to trade and negotiate with the West. Like most books of this period, it's a nice way of seeing the mindset and historical setting that led to Japan's transformation into the empire of WWII, growing from a feudalistic society into modern military powerhouse in just 70 years or so (arguably 1868-1945).The author depicts what the samurai were in interesting ways. He'll romanticize the samurai lifestyle, then suddenly mock it, and then he exposes it for the terrible thing it was- a class system that allowed for the worst kinds of atrocities to befall the peasant and working class. The biggest strength of the books is having characters that you grow to like commit the worst acts of cruelty because of this class system and their sense of duty. The author doesn't pull any punches when it comes to violence. I grew up with Kurosawa films and the Zatoichi series; I've grown pretty use to the things that might bother others. This book is not without it's flaws, but it is a good samurai story. It's also got a nice western revenge tale thrown in the mix with cowboys, six shooters, prostitutes- everything except Indians really. It's not for everyone and it won't change any lives. I wouldn't strongly recommend it unless you're specifically looking for a historical fiction that's heavy on the action. If you liked Clavell's Shogun, this is kind of like Diet Shogun- less pages, more ninja battles, and less characterization. But I liked it and will probably give the sequel a hundred pages or so to woo me into finishing. 3 stars. 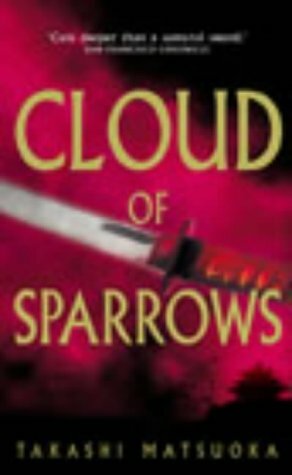 Cloud of Sparrows was a satisfying read, but it was not the best book that I've ever read. The plot and writing style were gripping and easy to read, and I learned a lot about feudal Japanese culture. I was, however, disappointed by the remaining loose ends at the conclusion of the book. The multiple plots did not all finish at the same time, and the last one seemed like a hasty ending.It was fascinating to read the differences of culture between the American missionaries and the feudal Japanese lords. One of the missionaries, Emily, is considered beautiful to Americans, but hideous to the Japanese. The missionaries are also shocked by the violence that the samurai so easily administer, such as seppuku (ritual suicide). The vast difference in rank between the daimyo and ordinary peasants is another foreign custom. In return, the Japanese are confused by western clothing, mentality, and even chairs. The book also has an element of magic. The family of the main character, Lord Genji, is cursed to see the future. Through out the story, Genji's advisors and enemies question the legitimacy of his powers. Some people see it as a symbol of his power, others regard it as a falsehood. I would have preferred it if the story didn't have any supernatural elements. It makes me wonder if the novel was aimed at being historical or magical.The book has a nice balance between action, suspense, and subdued peace. There are multiple plots ranging from the questionable loyalty of Genji's advisors, the bloody past of one of the missionaries, and the relationship between Genji and his geisha. The plots are nicely woven together and all seem to connect in the end. As I said, the end of the book seems not as thought out as the rest of it, but it was still an acceptable ending.Overall, Cloud of Sparrows was a very nice historical novel. It is evident that the author is knowledgable about feudal Japan. I would highly recommend this book to anyone interested in Japanese history. I confess that I am not very fond of novels about Medieval Japan written by westerns. Yes, it is an academic prejudice I developed during my years at college studying History. But I try to read as much as possible, good ones and apparently bad ones, so I can have my own and decent opinion. It was with this kind of feeling that I borrowed from my friend abluesindrag this book by Takashi Matsuoka. And what was my surprise when I discovered a well-written, well-researched and well-conducted story centered in the last years of the samurai rule. Besides the activity of many characters and the pauses made by the author to actually explain what is happening with every one of them, the book flows naturally and I could feel the weight of the period portrayed. Lord Genji is actually as enchanting as his homonymous Shinning Prince from centuries before; but the first one has the rationality of western culture and an understanding of English the second never dreamed of. He is, no doubt, my favorite character. I like his good humored nature and the descriptions of his sarcastic smile became engraved in my heart as the most notorious thing of this simple story. I especially appreciate the way Mr. Matsuoka cares to show two points of view: the Japanese and the North-American one, with all the differences and similarities (yes, there were, and I believe they were related to feelings) and respects both of them equally. An exquisite book! I immensely enjoyed every page of it. I loved the story, the complexity of the characters, the style, the imagery, and every little detail of the narrative. I was thrilled at last to encounter a read which, in my view, truthfully portrays the inner workings of Japanese feudal society, the rigid codes that used to rule the behaviour of each member of that nation. Even a daimyo - a Great Lord, who is answerable only to the Shogun and the Emperor - cannot really do what he pleases because he is required to adhere to the unspoken, age-old codes of conduct which have governed the actions of every individual from every social stratum throughout Japan for centuries.The story takes place on the brink of collapse of this system and we are given glimpses of the future through the incredulous, horror-stricken eyes of a true samurai. I really liked this beautiful and powerful approach by Takashi Matsuoka.Overall, I am greatly impressed by "Cloud of Sparrows" and I look forward to reading "Autumn Bridge" by the same author.P.S. October 2012: I gave Autumn Bridge 2 stars, it was a disappointment which, however, didn't manage to overshadow Cloud of Sparrows. Einerseits fand ich das Buch toll- es scheint gut recherchiert zu sein, verfügt über interessante, abwechslungsreiche Charaktere und eine Welt, in die ich gut eintauchen konnte. Andererseits wurde ich mit keinen der Figuren so richtig warm- sie wurden trotz ihrer Hintergrundgeschichten irgendwie nur oberflächlich gezeigt. Auch die Brutalität und das Crossover zwischen (durch Rückblenden eingeführter) amerikanischer und japanischer Welt störte mich. Es war auf jeden Fall ein interessantes Buch, das mich jedoch nicht vollkommen überzeugen konnte. Hilariously melodramatic. Everyone is the Most or Worst or Least of whatever they are. Clunky prose, and a wandering point of view.But oh, what a page-turner it was. And the research seemed very solid, though I'm no scholar of the place or time being described. So I read it all the way through, and cannot recommend it very well at all. Okay, Goodreads does not have the English cover. I started reading this and realized I probably read it already. I checked my book list and found I had read in 2003. I like books set in this time period of Japanese history; 1800's. There are a few X words to pass over in the beginning only. The method of story telling I thought was quite different. The author took you back and forth in time flawlessly. I think if you had a prior understanding of Japanese culture it would make the story much more interesting as some actions in the story do not fit western culture. Ketika lelaki itu berpaling menatapnya, Heiko berharap dia akan melihat :Rambutnya : sekelam malam tanpa bintang tergerai di alas sutra biru.Wajahnya : sepucat salju pada musim semi, bersinar dengan cahaya yang dicuri dari bulan (hal.24)Itulah serangkaian kalimat pembuka novel epik berjudul asli Cloud of Sparrows : An Epic Novel of Japan karya Takashi Matsuoka atau diterjemahkan oleh penerbit Qanita Mizan menjadi Samurai Kastel Awan Burung Gereja. Kalimat tadi telah memikat saya untuk terus membuka halaman selanjutnya novel menarik ini dan tak bisa melepaskannya hingga halaman terakhir.Dari judulnya saya telah bisa mengira-ngira cerita apa yang akan saya temukan dalam buku ini. Pasti nggak akan jauh-jauh dari persoalan pembalasan dendam di kalangan para bangsawan yang sekaligus menyandang gelar terhormat sebagai samurai. Kira-kira seperti kisah Musashi yang legendaris itu. Kisah epik tentang para samurai selalu berhasil memesona saya, baik buku ataupun film-filmnya. Cerita ini dimulai pada 1 Januari 1861. Saat itu rombongan misionaris asal Amerika Serikat di bawah pimpinan Pendeta Cromwell baru saja merapat di pelabuhan Teluk Edo. Mereka hanya terdiri dari tiga orang. Selain Cromwell, anggota lainnya adalah Emilly dan Mattew Stark. Misi mereka sudah jelas : menyebarkan iman Kristen di kalangan masyarakat tradisional Jepang yang di mata mereka adalah sebuah bangsa yang primitif dengan kebudayaan barbar serta agama yang "sesat". Tugas merekalah nanti menyelamatkan orang-orang di negeri tersebut menemukan jalan Tuhan yang benar.Yang menyambut mereka langsung di pelabuhan adalah Lord Genji, bangsawan agung Akaoka dari klan Okumichi, salah satu klan yang menentang kekuasaan Shogun Tokugawa yang berkuasa saat itu. Klan bangsawan ini selain terkenal dengan para samurainya yang gagah berani juga terkenal karena secara turun temurun melahirkan seorang pemimpin dengan kemampuan meramal masa depan . Tak terkecuali Genji sebagai penerus paling akhir yang tersisa dari keluarga Okumichi.Pada tokoh Genji inilah keseluruhan cerita Samurai berpusat. Kepribadiannya yang nyentrik baik sebagai seorang bangsawan maupun sebagai samurai telah sering menjadi penyelamat kaumnya. Ia tampan, cerdas, memiliki rasa humor yang tinggi, berpikiran terbuka meskipun tak terlalu mahir dalam urusan bertempur dan memainkan pedang walaupun ia telah berlatih sejak kecil. Kini usianya duapuluh empat.Para misionaris itu selanjutnya tinggal di istana sang bangsawan di Edo. Sikap Genji yang terlalu terbuka dalam menerima pendatang asing lebih memicu lagi kebencian Kawakami, musuh bebuyutan keluarga Okumichi, yang telah bersumpah untuk menumpas habis keturunan Okumichi sebagai pembalasan dendam keluarga. Seperti lazim diketahui, kehidupan para samurai zaman itu tak pernah bisa lepas dari urusan pewarisan dendam yang baru tuntas jika salah satu pihak telah musnah seluruhnya. Kawakami sadar bahwa ia dan pengikutnya tak akan dapat dengan mudah menghancurkan Genji, apalagi selama masih ada Shigeru, paman Genji yang kemahirannya bertempur nyaris menyamai Musashi. Pembunuhan dengan cara biasa-biasa saja pasti akan sulit dilakukan. Harus dicari cara yang lebih brilian. Maka ia lalu menyusupkan Heiko, geisha paling cantik di Edo sebagai mata-mata. Ia membayar Heiko untuk merayu Genji sampai pria bangsawan itu bertekuk lutut jatuh cinta. Celakanya, justru Heiko yang akhirnya tak mampu mengendalikan perasaan cintanya pada Genji. Takashi Matsuoka, penulis novel ini, adalah orang Jepang yang lahir dan dibesarkan di Amerika Serikat. Maka tak heran jika ia menulis dengan gaya yang sangat Amerika : lincah, segar sekaligus juga menegangkan. Lincah sebab ia seakan-akan telah memilih dengan tepat kata-kata yang digunakannya sehingga novel ini mengalir lancar dan dipahami sejelas kita melihat bintang-bintang di malam cerah tanpa awan. Meski penceritaannya terkadang melompat-lompat dari masa kini ke masa lalu tetapi kita sama sekali tak terganggu dibuatnya. Segar, karena ia menceritakan epik ini dengan penuh kelakar khas Amerika, terutama lewat tokoh Genji yang nyeleneh itu. Pun benturan kebudayaan Jepang dengan Barat, sering menimbulkan hal-hal lucu yang mengundang senyum dan tawa kita. Humor-humornya itulah salah satu faktor yang menyebabkan saya tanpa terasa menamatkan buku ini dalam dua hari.Menegangkan. Namanya juga novel epik, pasti terdapat intrik-intrik di dalamnya. Juga ada perang, darah yang memuncrat, mayat-mayat, potongan-potongan tubuh yang penggambarannya membuat mual. Menegangkan, karena kita menanti terkadang dengan rasa cemas dan penuh ingin tahu apa yang akan terjadi selanjutnya di bab berikutnya. Pasti tak ketinggalan juga romantisme kisah kasih asmara di antara para tokohnya.Takashi Matsuoka rupanya ingin mengkritik bangsa Jepang pada masa keshogunan dulu yang bersikap tertutup terhadap masuknya budaya luar/asing ke negeri mereka :Genji memandangi kapal-kapal di teluk lagi. "Mesin uap menggerakkan mereka, baik pada saat angin bertiup maupun laut tenang. Meriam yang dapat menimbulkan kerusakan bermil-mil jauhnya. Senjata api untuk setiap tentara. Selama tiga ratus tahun, kita memperdaya diri sendiri dengan kebanggaan berlebihan pada pedang, sementara mereka sibuk berusaha agar lebih efisien. Bahkan, bahasa merekapun lebih efisien sehingga pikiran merekapun lebih efisien. Sementara kita sangat suka hal-hal yang disamarkan. Kita terlalu tergantung pada hal-hal yang tersirat dan tak terucapkan" (hal.31)Namun, tentu saja itu terjadi jauh berabad-abad yang lalu sebelum hari ini. Jepang hari ini adalah sebuah bangsa yang sama besarnya dengan Amerika Serikat dalam banyak hal : ekonomi, teknologi, ilmu pengetahuan, kedokteran, kesenian... Apa yang bisa dilakukan Amerika Serikat, Jepangpun sanggup melakukannya. Kemajuan itu tidak diperoleh begitu saja. Semuanya melalui jalan panjang sejarah penuh luka dan berdarah-darah. Di samping tentu juga kemauan keras untuk belajar dan kebesaran hati menerima kebaikan dari manapun datangnya Samurai Kastel Awan Burung Gereja ini adalah buku pertama dari kisah sekuel yang lanjutannya akan segera terbit dengan judul : Samurai Jembatan Musim Gugur. Tak sabar rasanya menanti buku keduanya untuk segera mengetahui nasib Genji selanjutnya. Takashi Matsuoka - Takashi Matsuoka is a first-generation Japanese American writer living in Honolulu, Hawaii, United States. Before commiting full time to the writing profession, he used to work at a Zen Buddhist temple. His books, historical novels depicting American missionaries' visits to Japan, are often compared to Shōgun and the rest James Clavell's series. In addition to writing novels, Matsuoka also worked on the script for the 1990 film Pale Blood.